CasinoPop – New April Pop Treats! Enjoy daily Free Spins, bonuses and other goodies! Nothing better than having that little extra every day at our favorite gaming hangouts. At CasinoPop they are called Pop Daily Treats where they give away bonuses, Free Spins and other goodies every day of the week. A perfect opportunity to maximize the fun and chances to hit some monster wins. On top, there are extra Free Spins on level up for Silver and Gold members. 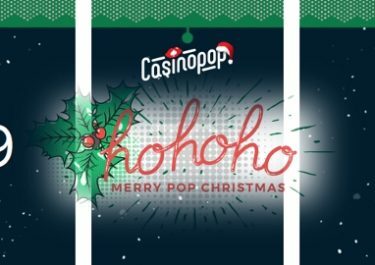 Not popped into Casino Pop yet? Then sign-up now and choose one of two options for their welcome package, either a very large deposit bonus + Free Spins or multiple welcome bonuses for the first 4 deposits. Bonus terms and conditions apply. April has been a fabulous month at Casino Pop as they will fill every week until further notice with awesome specials that will reward all those players stopping by from Monday to Friday. Free Spins, Epic Spins, generous bonuses, tournaments, challenges and one day per week a surprise offer will make for great gaming throughout the coming weeks. Speedy Tuesday: Make use of the double speed on the level bar to progress at twice the speed and to collect more rewards from the popSPIN game. Check your Rewards area for a wager free bonus. Extra Level-up reward: Throughout the campaign, all Silver and Gold players leveling up on the progress bar will be rewarded with extra Free Spins and on every 10th level with Epic Spins. Bonus terms and conditions apply to all daily offers and extra rewards, read them carefully.